This map is directly descended from medieval mappamundi, dating to the 7th century AD. They were "teaching rather than locational devices," intended "primarily to provide a visual narrative of Christian history cast in a geographical framework, not to communicate geographical or cosmographical facts." Woodward 1985, 518, 519. It follows the model of the T-O map, centered on Jerusalem with East (the biblical location of Paradise) at the top. See Notes on ID #1003, T-O World Map from the Novissime Hystoriarum. Among the images on the map are the four rivers flowing from Eden, "Le Pape" in Rome, and the Devil in northern Asia. For a detailed description and analysis of the map, see Brown 2000. 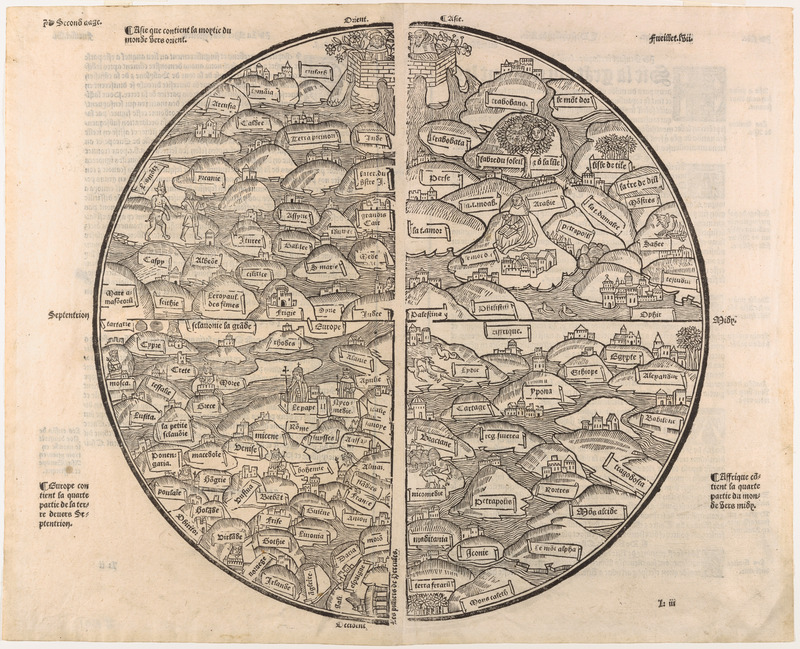 There were two earlier versions of this map, in 1475 and 1488; the 1491 woodblocks contain improvements reflecting "the work of a thinking individual." Campbell 1987, 148-49. This copy came from the Paris edition of 1543. See generally Brown 2000, Shirley # 17. Brocardus, de Monte Sion. (1543). La Mer des Histoires. Paris: N. Couteau for Ambroise Girault.